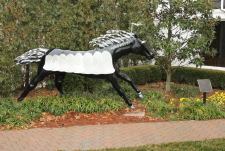 Photo of Barbaro statue by Gayle Ewadinger ©Gayle Ewadinger. Photos of gravestones by Liz Martiniak ©Liz Martiniak 2003; all rights reserved. Photos of gravestones and Eight Belles statue by Kurt Lemke ©Kurt Lemke, 20013; all rights reserved. CHURCHILL DOWNS in Louisville, Kentucky, is home to the Kentucky Derby, first run in 1875 and won by Aristides. 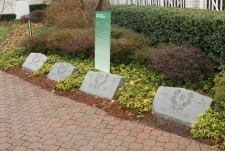 The track is also home to the Kentucky Derby Museum, which arranged to have the remains of several Kentucky Derby winners relocated to the track, and markers provided. The first of these was BROKERS TIP, who won the 1933 Kentucky Derby famous for the "fighting finish" photograph that shows the battle engaged by the jockeys riding Brokers Tip and second place finisher Head Play. Brokers Tip, one of five Kentucky Derby winners bred and raced by Col. E.R. Bradley, stood initially in Kentucky and was later moved to California where he died in 1953. His bones were used for demonstration purposes at the University of California Davis Veterinary School, and those that could be located were finally brought to rest at Churchill Downs. SWAPS was the California champion of the 1950s. He won the 1955 Kentucky Derby defeating the Eastern champion Nashua, and although plagued by a weak hoof, continued on with a great racing career, setting or equaling 8 time records including 5 world records. 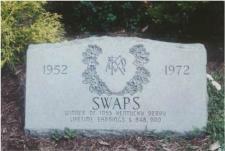 SWAPS initially stood at stud at Darby Dan Farm in Lexington, Kentucky, but was later moved to Spendthrift Farm. He died here in 1972, on property now known as Green Gates Farm. His remains were later exhumed and reburied at Churchill Downs. CARRY BACK, a true rags-to-riches story, became known as "the people's choice" for his great appeal to the common man. Bred from very modest parents, CARRY BACK was a stakes winner at 2 and champion at 3, winning both the Kentucky Derby and Preakness Stakes. He retired to stud at his owner's Dorchester Farm in Florida, and when he died in 1983, his ashes were sent to Churchill Downs as a final resting place. Churchill Downs hopes to become the final resting place of additional past and future Kentucky Derby winners as time goes on. BARBARO was undefeated when he ran in and won the 2006 Kentucky Derby, which he took by 6-1/2 lengths, but in the Preakness Stakes he suffered a catastrophic injury in front of the grandstands just after the start of the race. Despite heroic efforts to save him -- his right hind leg had been shattered in more than twenty locations -- complications from his surgeries and increasingly ineffective pain management led to to the decision to euthanize him on January 29, 2007, a little more than six months after the initial injury. The public outpouring of grief and support for his owners and connections were phenomenal. 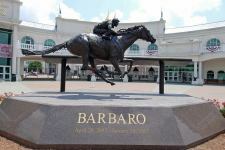 A bronze statue by artist Alexa King, unveiled April 26, 2009, was placed on top of his cremated remains outside the entrance to Churchill Downs. 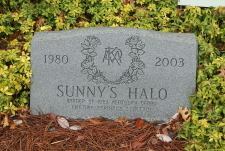 SUNNY'S HALO was the champion two-year-old in Canada in 1982 and won the Kentucky Derby, becoming the second Canadian-bred to do so, following Northern Dancer. He retired to stud in Kentuckky and was later moved to Double S Thoroughbred Farm, near Tyler, Texas, where he died in 2003. He was buried at the farm, but when the property was scheduled for development, a devoted fan, Rita Nugent, drew attention to the situation and gathered support to have his remains cremated and reburied at Churchill Downs, the site of his greatest victory. The steel grey filly EIGHT BELLES, winner at age three of the Honeybee and Fantasy Stakes, finished second in the 2008 Kentucky Derby, but collapsed during the race cooldown with condylar fractures in both front legs. Her injuries were so severe, she was euthanized on the spot. On August 25 her cremated remains were buried in a walnut box in the museum garden grounds, not far from the site of previous winners of the Derby. In 2010 Tony Viscardi's metal sculpture dedicated to Eight Belles for the city of Louisville, was installed at her gravesite at the museum.